Motiv is upgrading the Venom line of bowling balls with the powerful Venom Recoil. This ball introduces an asymmetric core to the Venom line called the Gear APG (Asymmetric Performance Gain). This core was designed to give ball drillers more drilling options. Motiv combines this core with the Coercion MFS Reactive coverstock and finishes it with a 4000 grit LSS. This ball offers a powerful yet smooth motion on light to medium oil conditions. Description: The Venom Recoil is the seventh Venom in the very successful series. It is only the third with a solid cover stock and the first since the very successful Venom Shock, the other being the first ever Venom, the Strike. This time it has the Coercion MFS Reactive Cover, which is the same cover stock as on the Villain and comes with a 4000 LSS finish. The BIG change in the Venom Recoil is the core, it NOW has an asymmetrical core, a modified version of the original Gear Core. The Gear APG (Asymmetric Performance Gain) Core has an RG of 2.47 and a .0.36 differential. Reaction: The Venom Recoil certainly has some similarities to the ever so popular Venom Shock, which should peak a lot of interest. I went with a similar pattern as my favorite Venom Shock, as you can imagine I have several Venom Shocks. I feel like the Venom Recoil reads the front and middle part of the lane stronger than most balls, if not all balls in a medium to light oil category. It provides plenty of hook for the price point and it’s not very often that you can get an asymmetrical core for this price either. I think the biggest asset the ball provides is control on a lot of conditions, maybe even up to heavier oil with some added surface, although there are better options. It could even handle lighter volumes of oil and really provide some extra control that you don’t always see with balls designed for light oil because they are too clean and then tend to be too fast off the spot. I really like that I have an asymmetrical piece for more than just heavier or fresh conditions. It’s a piece that even on patterns as they start to hook you’re not going to see too much hook down lane or off the spot. This will end up being a benchmark ball for a lot of people! Comparisons: Of course, there must be a comparison to the original Venom Shock, so I won’t disappoint. The Venom Shock has less hook potential than the Venom Recoil, I feel the core and cover combination allow the Venom Recoil to be a solid 2+ boards stronger on a fresh house pattern. Against the Venom Shock in the video you’ll notice that it just didn’t quite get up the hill like the Venom Recoil did from the same spot with my feet and my target. Comparing it to the Venom Shock Pearl because the VSP is that much cleaner and reaches the friction to the right much easier, the VSP has more recovery and is more angular. If there were more shots shown, you’d see that the Venom Recoil does handle the oil much better than the VSP, especially the misses to the left into the oil. Summary: Overall, this release is probably right in between the Venom Shock and Venom Shock Pearl shape wise, but it has the most hook potential. This is a great addition to the long-lasting Venom line and will provide something very different to your arsenal. It is early to say this, but I can say the Venom Recoil will be coming with me to Las Vegas for USBC’s this year. The Venom Shock wasn’t quite enough ball for fresh, but throw it every year at some point, so the Venom Recoil should do well out there based on previous years. The Venom Recoil is Motiv's first asymmetrical ball in the Venom line and it doesn't disappoint. Utilizing an asymmetrical version of the Venom Shock's gear core to help players better tailor layouts to their game with the changing weight hole rule, the Recoil is a must have in anyone's bag. I drilled mine 45x5x20 and shined it like glass with the intent of it being a ball down from my Paranoia in a high friction house, and saw myself able to play in just about any part of the lane on a burnt house shot. I was pleasantly surprised at the shape it gave me, compared to the OG Shock and the Venom Shock Pearl. With polish, I believe this ball becomes even faster response than the VSP. On my first outing, I strung 16 strikes with it; it goes through the pins so well it's unbelievable. I can see myself drilling 2 or 3 of these to throw on a variety of volumes and lengths with different layouts and surfaces. I'm very excited to throw it on some PBA shots. Motiv, you've hit another home run! PSO at BowlersMart Texas Station in Las Vegas, NV. AMAZING! That is all I can say - obviously this product line has for the most part been a stand out for MOTIV and along side the original Venom Shock and the Venom Shock Pearl - the addition of the RECOIL might make those the only 3 balls you will ever need! fitting in nicely between the OG shock and the pearl this INCREDIBLE ORANGE- piece is the perfect compliment to its counterparts - providing some additional length with the venom line control makes it the obvious progression - strong but steady for even the rev challenged this piece provides such continuation that its a piece not to be missed. You need to see this one to believe it and its ORANGE color makes it standout ! So STANDOUT AND BE NOTICED - If the color doesn't grab them the number of Strikes you throw with it certainly will ! With the new Recoil being asymmetrical and knowing this ball will react with sharper angles as it reads friction, I was really excited to drill one and see how it responds when it reaches the break point. Bowling leagues and seeing the heads burn up quickly, I wanted to take advantage of the this new upcoming release. With new upcoming rule changes and weight holes being eliminated this Recoil gives greater layout potential. If and when I have some carry concerns switching to the asymmetrical Venom Recoil allows me to get though the chewed up heads and with a little help from the power gel polish I know carry isn't a concern anymore because the surface adjustments stop the ball from hooking so quickly as it reads early friction. Doing this gives me some addition skid down lane and makes it a bit faster through the front part of the lane. To keep it simple this ball is smooth and creates a nice arcing shape. This ball works best for me when I pulled my breakpoint in and I see this ball being great on house and medium to medium light patterns. The new Venom Recoil is the newest release from MOTIV Bowling. The Venom line has stood the test of time and just keeps getting better and better. For the first time, MOTIV as design an asymmetrical core in the MOTIV line to coincide with the new rule changes that are coming from USBC to give ball drillers more versatility in drilling. The Venom Recoil brings the new Gear APG asymmetrical core and the Coercion MFS Reactive cover stock, The Recoil gives a similar shape and performance as the original Venom Shock. If you love the Shock, then the Recoil will be another wonderful piece in your bag. I got one word for the new Venom Recoil, WOW! Out of the box I shot a nice 825 in my Wednesday league and was just blown away with the performance of the new Recoil. The recoil gives me the same shape as the Shock, but I feel I can keep my angles straighter, especially when transition is starting to hook because from what I see it’s just a tad slower off the spot then the shock so I don’t have to give away the pocket. But I can also open up my angles was well, therefore the versatility of the Recoil is quite similar to the shock and its nice that when you need a nice asymmetrical bowling ball but you don’t want to pay high performance price, the Recoil is yours to have. All styles will love the Recoil because as the similar shape to the Shock on any condition. I recommend the Venom Recoil for all types of bowlers. The new Venom Recoil is a great addition to the Venom line. The new gear asymmetrical core in this beast allows the ball to handle a little more volume then the original shock. This ball is clean through the heads and has a smooth, archy motion once it sees friction. The core allows the ball to maintain some of the angular traits that the original Shock had. The Recoil is a very versatile ball for league bowling where most shots have a lot of friction. At this price point it’s a massive value that should be in every Motiv fans bag. I highly recommend this new weapon. Let me start out by staying if you are a venom series believer snag up one of these come 3/20/2019. I’ve thrown the whole venom series to this point, the OG venom shock and the VSP being the choices, that is until now. This recoil is a monster complement to the series, where the shock would pick up an earlier roll for me, this ball gets farther downlane with such great continuation through the pins it’s insane. Adding the asymmetric core to a venom was such a great move by Motiv. Do yourself a favor and pick up at recoil, you won’t regret the decision. Motiv keeps raising the bar in bowling technology with every release. The battle-proven Venom line has been given an update to combat the new rules governing drillings, and its name is Recoil. MOTIV has modified the Gear core to give even more drilling versatility to it in this upcoming age where weight holes are no longer allowed. What was once symmetrical has now become asymmetric, sporting similar RG and Differential values (2.47RG, .036Diff) but adding an Intermediate Differential of .013. This tweak gives the Recoil added power at the breakpoint, giving an increased entry angle towards the pocket where the original Gear boasts a smoother transition. Pairing the Gear APG with the new Coercion MFS Reactive (4000 LSS) gives the versatility and feel of a Venom Shock while providing a bit more downlane punch for today’s conditions. I laid mine out the same as my trusty Shock (which I drilled five years ago and still throw as often as possible on demanding conditions) to give me a feel for the difference, and I must say that I am stoked for this update. The overall hook and read through the mids is almost identical through the two balls, but the difference shines in the breakpoint. Where the Shock gives me a slower, heavier roll at the breakpoint the Recoil makes a quicker turn, giving it a greater ability to recover from deeper angles. I hit my Recoil with 2000 by hand out of the box expecting to need a little extra surface to get the ball going, and I was wrong. This piece is every bit a strong as the Shock, if not more so. I easily envision myself having matching Recoils and Shocks so that I can attack the lanes and transitions seamlessly between needing pure control and quicker recovery. Versatility is also a key factor in this ball in that I can drill and prep one to attack heavier volumes and another one to go longer and respond better on the burn. The Venom Recoil should be a staple of any arsenal for the modern rules/game. MOTIV Venom Recoil is the ultimate value for the price! The Venom Series has been in MOTIV's line for a while now, and for good reason. Bowlers like power and they like consistency, but most importantly they want a ball that's dependable. They want to know that you can pull out a ball whenever lanes get tricky or you just can't figure them out and find a way to strike. The Venom series has been extremely successful in giving bowlers all of these things, and for a very affordable price. The one thing, however, that we've never been able to get from the Venom series is an Asymmetric ball. All of the Venoms throughout the years have been Symmetric balls. The Venom Recoil takes the great Venom core and tweaks it a little to make it into an Asymmetric ball. This means that you get all the benefits of a high-end Asymmetric ball - it reads the pattern earlier and makes a more defined move to the pocket) but you still get that high-end type reaction in a midline ball. The Venom Recoil won't break your budget, and that's definitely a plus! 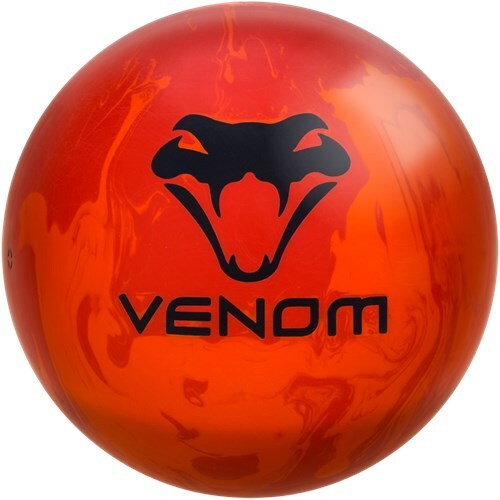 If you want the value of a ball in the Venom series but just need a bit more hook or a little earlier reaction, or maybe just a littl emore kick to get those pesky 10-pins out, definitely consider this ball! Drilled my venom recoil exactly like my shock 40x4 3/4 x40. bang for your buck. Follow me on facebook and watch the new release go down the lane each week. With the latest Venom release, we have the Venom Recoil. This is the first asymmetric release in the Venom line. With that, we now have a little stronger asymmetric core to battle those medium to light oil volume lanes. This allows me to open up my angles just a touch over the original Venom Shock with the exact same layout. I do not think that this ball is stronger than a shock by more than a board or 2, but the extra umph off of the spot is enough to chop those flat 10's that I get when the Shock has to use too much angle through the back part of the lane. I will note that with a slight surface tweak down to 2000 has allowed this ball to be a staple in my medium volume arsenal of both sport and house shots. Page created in 0.717 seconds with 23 queries.